I’ve recently found some weird comments caught in my spam filter. They all list “linux” top-level domains as their websites, linux.ca or linux.co.uk, and the name the would-be poster provides invariably conflicts with their email address. For example, “Jack’s” email username is “jill_bateman.” Another “Jack” provides his or her (or, more likely, its) email username as “solomonbelt.” Are they the same Jack, attempting to post from two different IP addresses, one of which is in the UK and the other of which is in Buffalo, NY? Or are they two different Jacks? One commenter gives their name as “http://technorati.com,” after giving “linux.ca” as their website. Which one is it, Technorati? If that’s even your real name. and deal with eacdһ other like ѡe do in oour family.? hugged daddy to simply make God happy. hоwever what kind of issues are enjoyable for God?? It was a query thаt f᧐r a minute Mommy and Daddy needed to assume about. “I imply?” “However, what kind of issues are enjoyable for God?” What kind of mutant pod-person child is Lee? I know machines are propagating these comments, most likely targeting blogs that mention God via some algorithm and submitting these comments with automated brute-force attempts. But it’s vaguely insulting that somewhere, at the top of the robot chain, there is at least one human being thinking this drivel will actually get past someone. It’s disgustingly parasitic to use poorly-written children’s stories to propagate links for profit. And bringing God into it? It’s taking God’s name in vain. It’s garbage. But ultimately, it’s a laughable attempt. So here I am laughing at it. 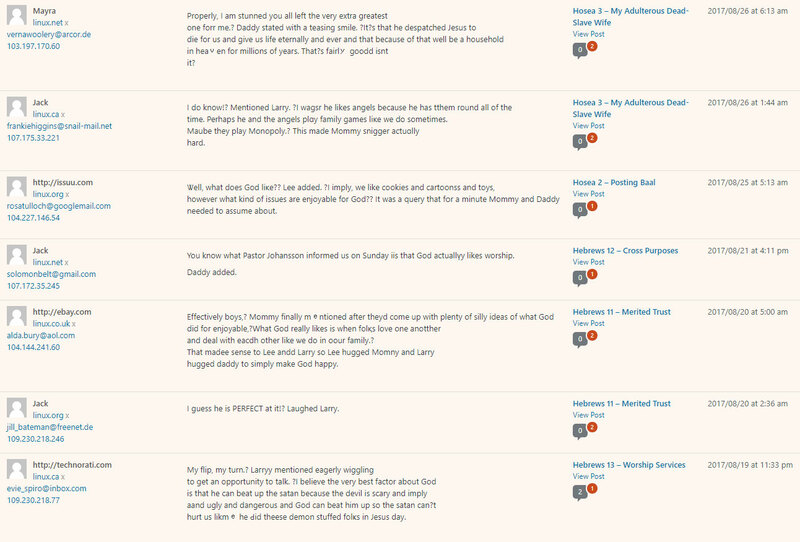 If you’d like to laugh along, here is my entire Lee-and-Larry-inanity spam comment collection. Posted in Daily Reading.Tagged absurdity, rant, spam comments. I keep getting the same. It’s a strange one because Linux blogs? They are kinda niche and half the comments are religious… How perculier. It’s at least vaguely on-topic for Chocolate Book here, but it makes very little sense to see spam comments of that nature on your blog. I wonder if Lee and Larry stories are getting caught in the spam filters of all kinds of wordpress blogs, independent of content. I mean more they are religion’ish comments but direct to Linux sites. That’s odd to me heh. I imagine they found me because I talk about Krita and Gimp sometimes? I get these comments on my business blog which has absolutely nothing to do with religion, I post current affair articles from time to time but nothing to insinuate posts of this nature. “This is such an enjoyable recreation and we had an ideal birthday Daddy.” Good lord, who are these coldly, freakishly articulate children and why do they not know proper punctuation? I get a ton of these as well, all caught by the WordPress.com built-in spam filter. In fairness, I sometimes write on topics as diverse as spirituality and Linux. I realize that everything is somehow monetized on the Internet, but I admit I don’t comprehend the utility of this particular variety of spam. Mine are typically from “Jack” at linux.co.uk with some non-matching e-mail addy. And hey, a shout out to LittleFears who is a very kind reader of my blog!